The bag is an easy messenger shape, if slightly rounded and loose. And, gasp, it lacks the ubiquitous fringing and beading and embroidery that one might find easily on a more traditional boho bag, like, oh, anything by JADETribe. Here, there’s not an ethnic print to be found. 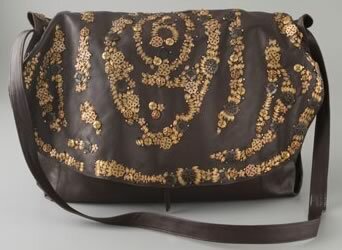 Rather, it makes its mark with the easy shape, lovely dark pebbled leather, and funky design of mixed metal paillettes on the flap. The leather looks lusciously soft and moldable, a fitting contrast to the roughness of the paillettes. There’s no ethic print, but the metal certainly makes a pattern that holds its own. Buy through Shopbop for $508.